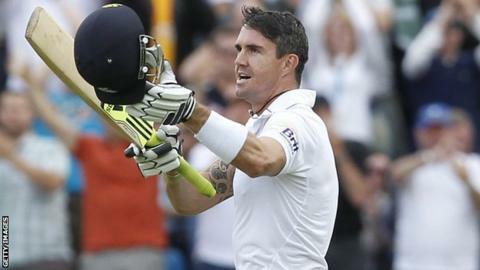 Kevin Pietersen struck an imperious 21st Test century as England closed day three of the second Test 68 runs behind South Africa on 351-5. Pietersen, dropped on 52, was at his majestic best, with 22 fours and a six in a breathtaking unbeaten 149. England lost Alastair Cook (24) before a rain delay, and quick wickets after lunch saw them 246 adrift at 173-4. But Pietersen added 147 with debutant James Taylor (34) and his brilliance changed the complexion of the match. The 32-year-old's third Test century against the country of his birth saw him pass 7,000 Test runs and go above captain Andrew Strauss as the eighth highest scoring England batsman in Test cricket. "It was a thrilling day for England supporters, Pietersen came out and you knew it was going to be war, it's his arrogance and confidence against their fast bowlers, he's not going to back off, it's not his scene, and he played a fantastic innings, one of his best, it was the way he bristled he went after them, if you're a cricket lover and you didn't enjoy today there is something wrong with you." He signalled his intentions by getting off the mark with successive pull shots to the boundary off the rapid Dale Steyn, and he later launched the world's fastest bowler straight down the ground for a magnificent six. It was in stark contrast to the problems suffered by his team-mates. Only 12.2 overs were possible in the morning session before rain descended to prompt an early lunch, but in that time Cook was trapped lbw on the front foot and the only thing the review showed was that the ball would have hit the middle stump three-quarters of the way up. Strauss had looked reasonably untroubled, leaving the ball well outside his off stump, but having hit his seventh boundary and moved within sight of a half century, he rather left his bat out to dry outside the off stump and was caught behind in the fourth full over after the interval. It brought Pietersen together with another England batsman of South African origin, Jonathan Trott, and that seemed to intensify the fighting spirit of the tourists. Trott played an uncharacteristic loose cut at Steyn and was caught at first slip by Graeme Smith for 35. Then Ian Bell, who had struck spinner Imran Tahir down the ground for six, also attempted to cut one from Jacques Kallis that was too close to him and Smith took another smart catch at first slip. With Morne Morkel steaming in from round the wicket, the field was out for Pietersen, inviting him to attack. He should have been taken close in as it transpired, fending one to Hashim Amla, who could not react quickly enough as the ball cannoned into him at short leg. Pietersen thrashed the next two balls emphatically through mid-wicket as if to compound matters for South Africa, and in a thrilling passage of play he added two more swashbuckling boundaries off Steyn in the next over. As the crowd launched into an enthusiastic if far from classical rendition of the national anthem, Pietersen pulled Kallis dismissively to the boundary and whipped a straight drive down the ground to keep them captivated. What Taylor would have thought of things is anybody's guess, making 11 of a fifty partnership and 20 of the century stand but he played a calm foil, displaying a determined resistance that his recent predecesssors at number six might not have done. Having reached 99 with another cavalier boundary through the covers, Pietersen nonchalantly stepped down the pitch to Vernon Philander and placed the ball into the leg side for the single that took him to three figures. Taylor's encouraging maiden Test innings ended with an inside edge into his stumps but Pietersen remained in the late evening sunshine to add 31 with the fluent Matt Prior (20 not out). England, who trail the three-match series 1-0, still have to bat for much of day four to put South Africa under any sort of pressure, but with skipper Smith leaving the field late on because of injury, the tourists will not be quite as happy with proceedings as they had been midway through Saturday afternoon. Smith will have a scan on his knee after falling awkwardly on the field, while the participation of his opening partner Alviro Petersen - who has not taken the field all innings because of a hamstring strain - remains in doubt. Listen to Jonathan Agnew and Geoff Boycott review each day's play via the Test Match Special podcast.